Google’s Play Books… dead or not? I routinely manage publishing accounts on Amazon KDP, Apple, Ingram Spark and Google Books for our clients. It’s a little extra service I provide for those that really don’t want to go through the hassle and often Kafkaesque rigmarole of setting up accounts and uploading files. Over the last year I’ve found that access to the Google Books publishing interface has been sketchy at best. Often the “Continue to Partner Center” link doesn’t appear and there’s no apparent way in to upload new books, change settings and the like. There are a number of forum threads and articles that talk about Google Books closing down. I spent a while this morning talking with Ankit from Google to try to get some reassurance on what’s actually happening. …you can use your existing account and publish your books through your Partner Center account. 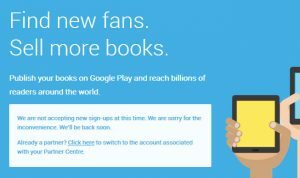 However, to improve our content management capabilities and our user experience, we’ve temporarily closed new publisher sign-ups in the Google Play Books Partner Center. You can continue uploading your books to Google Play Books. I asked whether there was any official word on the situation that I could pass on to my clients to reassure them that the time and effort of publishing with Google Books was going to be worth it. As of now we do not have any information regarding closing of Google Books. If there are such plans in future, you will be notified accordingly. And new sign-ups are closed because we’re improving our content management capabilities and user experience. I was able to log into one of the accounts today by going to: https://play.google.com/books/publish/. You need to log into your Google account first though. Well, it’s a little mysterious and I suspect that Google are being tight-lipped as they had to close the doors because they were worried about account abuse and piracy. It WOULD have been nice to get some official word on this rather than have to read about it on forums and the rather blunt message on the sign up page. I’d say stick with it while they sort out the situation. Things were rough and ready for Amazon KDP while they transitioned from the old MobiPocket systems and I think it’ll be the same with Play Books. 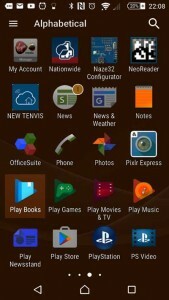 When they come back, they’re going to be BIG – don’t forget that they have the awesome might of Google behind them and that the Play Books reader is installed at standard on all Android phones, tablets and devices.It’s also linked directly to their shops in the same way that Kindle and iBooks are. Keep uploading your titles and be ready for the gold rush! (famous last words).